The church at Minster Lovell (Oxfordshire) lies to the south of the ruins of Minster Lovell Hall, adjacent to the River Windrush. The Hall was rebuilt between c.1431 and c.1442 by William 7th Baron Lovell (of Titchmarsh in the County of Northampton) (c.1397-1455). William was also responsible for remodelling Minster Lovell church, and had previously fought alongside Henry V at the Battle of Agincourt (1415). 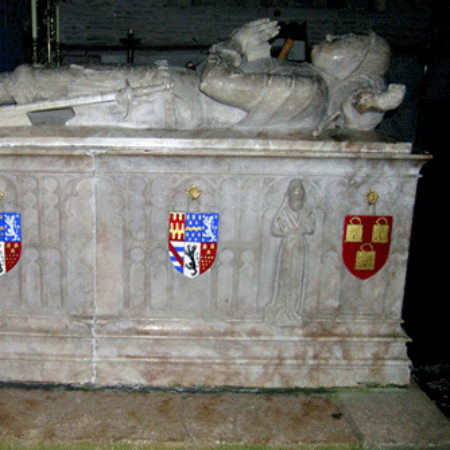 It is probably William’s tomb that survives in the church, although there is no inscription or documentary evidence to confirm this claim fully. 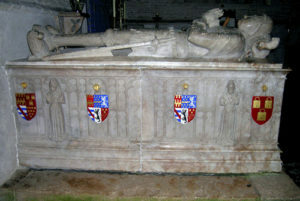 The alabaster tomb-chest is now positioned in the south transept of the church. The recumbent effigy takes the form of an armoured knight, whose hands rest together in prayer. Five diminutive figures and ten heraldic shields are depicted in architectural niches on the cusped-panelled chest below. The shields bear the arms of the Lovell and Beaumont families (Maud de Beaumont, married an earlier William Lovell [born c.1102], and William 7th Baron Lovell’s son John married Joan Beaumont). However, the shields have been heavily repainted (probably in the nineteenth-century), so it is impossible to conjecture what emblems they would have originally displayed. On the north face of the chest are two sculpted female ‘weeper’ figures clad in robes and elaborate headdresses, their hands outstretched in supplication. On the south face, towards the western end, a crowned Virgin Mary figure holds a potted lily in one hand (signifying the Annunciation), and supports the Christ Child with the other. To the east stands the crowned figure of St Margaret of Antioch, holding a book under her left arm. She pierces the dragon beneath her feet with the long, cruciform staff, supported in her right hand. Both figures are positioned on plinths, perhaps to emphasise their superiority to the partner ‘weeper’ figures on the north face of the tomb-chest. A sculpted St Christopher is positioned on the western face of the tomb (below the effigy’s head). The crowned figure perches on a plinth, and is shown (in the usual manner for this period) crossing the river, clutching his flowering staff. His head is angled upwards to gaze at the Christ Child, who he bears on his shoulders across the river. The Christ Child supports an orb in one hand, and blesses the saint with the other. In the medieval period, saints provided protection, guidance and intercession with God during the time spent in Purgatory (after death and before the Last Judgement). Saints also acted as a conduit between the living and the dead, offering spiritual rewards for visitors who prayed or performed pious works on behalf of the deceased (and thus assisted with their ultimate salvation). Weepers (often representing a relative or associate) might also encourage viewers to pray for the souls of the dead. The theoretical purpose of the medieval funerary monument was religious. Nevertheless, many were also intended to promote the power, wealth, status and pedigree of a family, and to commemorate the worldly achievements, gifts and position (or even occupation) of an individual. Tombs also served to remind the living of the piety, virtues and devotion of the deceased and their family, and to prolong the presence and memory of the dead in the community. Monuments could function as a source of comfort for the living by helping to speed the process of grieving, and by acting as a lasting memory to families of the deceased. The customary function of St Christopher (after his emergence in English and Welsh illumination, glass and wall painting from c.1350) was as a protector against misadventure, as a friend and helper, and as an intercessor in this life. His intermittent appearance on tombs and brasses from the fourteenth century onwards, suggest that these pre-obit functions were transferred into the afterlife. St Christopher is most commonly depicted in mural painting between the late thirteenth and early sixteenth centuries. His image is frequently positioned on the wall opposite the principal church entrance (typically north or south nave), meaning he is visible to visitors entering or leaving the building. Examples can be seen at nearby Black Bourton and Woodeaton churches (Oxfordshire). Cheetham, F., Medieval English Alabasters, Oxford 1984, 92. Marks, R., Image and Devotion in Late Medieval England, Stroud 2004, 177. Sherwood, J., Pevsner, Nikolaus, The Buildings of England: Oxfordshire, Harmondsworth 1964, 706.